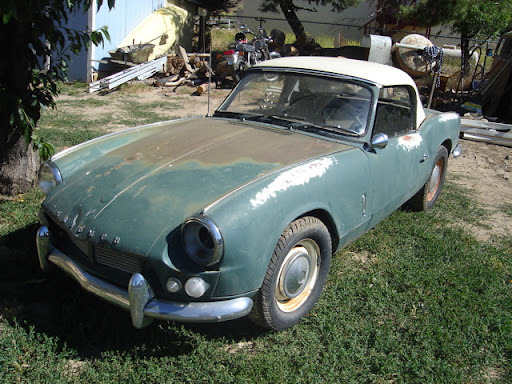 In June of 2008 I purchased a 1964 Triumph Spitfire in the high desert. Patiently waiting for a little attention. It hadn’t been driven in years. The engine probably needed a major overhauling. The brakes were seized. The floorboards were rusty. But, the frame had very little rust. The body needed a little work on the front and the rear. She had all of her chrome bits, and except for the front bumper, they were intact. The seats weren’t the original seats, but they almost fit. It was definitely going to be a major undertaking. Not only was I going to restore this 45 year old car, but I was going to remove the engine and replace it with an electric motor with lead acid batteries. Spitfires make great conversions and there are a dozen other examples of electric Spitfires to be found on the web. I couldn’t wait to get started. Back on the road and turning heads. Jump ahead to today. The vehicle is a daily driver and it looks beautiful. There are plenty of parts on the car that need to be finished. This section of the blog will follow my progress in doing the final restoration and eventually upgrading the batteries. Copyright © 2019 Daniel Busby.